While on the body recovery mission aboard the cable ship Minia, the ship's carpenter, William Parker, persuaded his captain to allow him to reclaim wood from Titanic's wreckage, otherwise known as flotsam. He collected what he could from the frigid ocean and made items such as this intricately carved 12 5/8" x 15 1/2" oak picture frame. Some items he gave away but this frame stayed in his personal collection and was eventually passed down to his decedents. Titanic oak wreckwod is especially desired because it was primarily used in higher-class areas of the ship, such as the grand staircases. Because of the close tight wood grain on this frame Titanic experts believe it was made from parts of the molding or trim. 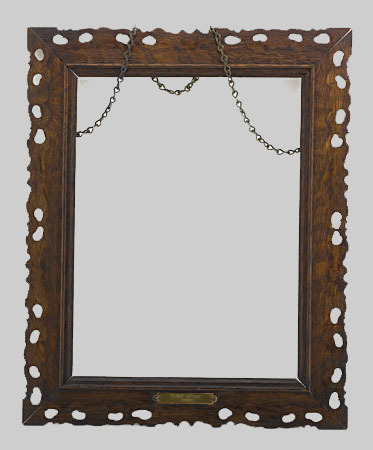 Rare picture frames, such as this, created from Titanic wood by William Parker are frequently mentioned in the the book "Titanic - Touchstones of a Tragedy" by Steve Santini.